Many people find it difficult budgeting their money or they have such large bills due at specific times of the month that they do not make enough during that time period to cover the bills. 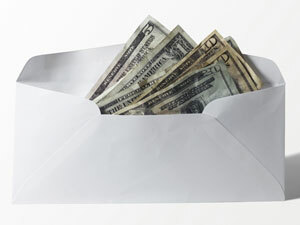 One popular way to make sure that you have enough money to pay your bills is to use the Envelope Method. First you will make an envelope for every bill that you pay each month and bills that you pay quarterly or yearly. Put on the front of the envelope the name of the bill, how much is due each month and the date it is due. At that point you will determine how much you would need to put into each envelope in order to pay the bill each month. If you get paid weekly you would put in ¼ of the bill each week. If you get paid bi-weekly you would put in ½ of the bill each pay period. The bills that are due quarterly would be divided by the number of pay periods in that quarter. Yearly bills would be divided by the number of pay periods in a year. There may be months that you receive an extra check and that check should be divided evenly between the envelopes so that if you have a short pay period you will have extra money in the envelopes to help you pay the bills. If you would like to start a savings account you can add that envelope and make sure to put a set amount in the envelope each pay period. When you have enough money to pay the bill you can either pay the bill with the cash that is in the envelope or you can deposit the money into your bank account and write a check or get a cashier’s check or money order. One thing that makes this system work well for some people is that they will not accidentally spend it when writing checks, but you have to make sure not to take any of the money out of the envelopes for other expenses. Another good idea to make sure you have extra money if needed is to continue to put the money away in the envelopes for bills that you no longer have. For example, if you have a car loan and it is paid off six months after starting the envelope method, you can take that amount of money and divide it among the other envelopes each month or put it in your savings envelope. If it was difficult to manage all your bills with that payment then you can put less of that payment amount in the other envelopes or savings. If you are worried about having the money sitting in envelopes in your house you can pay your bills with the envelope method but without the actual envelopes. You will still break down your bills by pay periods and each pay period you will send that payment in, so you may be putting money towards a bill every week or every two weeks. This is especially helpful for loans because each time you put money towards the principal you save money on the interest. By paying a loan weekly or every two weeks you can cut down the number of payment you will have to make and ultimately save money.